With Mothers Day just around the corner, celebrating your mum with these raspberry cream cheese bars is always a good idea. Also, kids and husbands- no woman would object to cheesecake for breakfast. Especially since these bars are loaded with healthy fats to fuel the brain and contain almost zero sugar!!! Like, I can actually eat them! This machine is a POWER HOUSE. Grinding cashews? No prob. 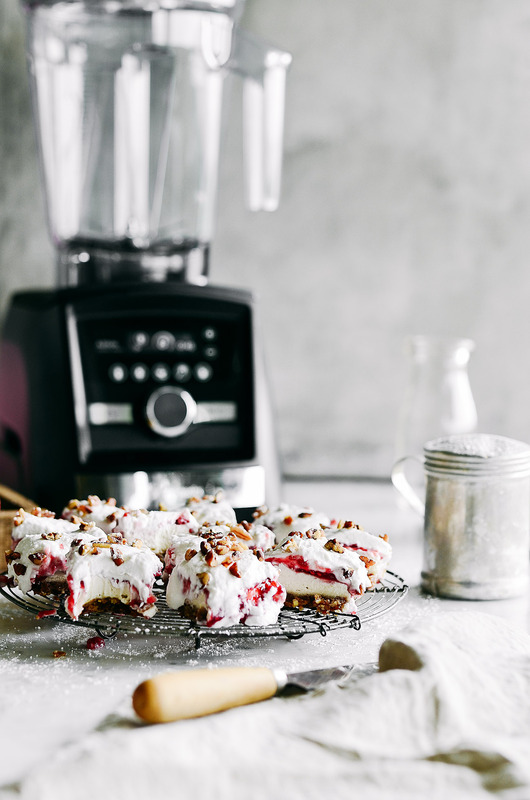 This Vitamix blender whipped up those cashews in minutes and turned them into the creamiest rich cream cheese filling. Mmmmm. *Pro tip: make sure to use the tamper to accelerate the process of blending as well as scraping the cashews down the sides of the blender so that it gets SUPER smooth. The layers of these cream cheese bars are so simple and I usually have everything on hand anyway (which doesn’t help snacking :). Keeping a carton of cashew cream cheese in the fridge is a must! I literally haven’t found one thing it’s bad on- sweet or savory. If you’re feelin the need for something sweet after dinner it’s really easy to throw a batch of these bars together! One more fabulous thing you need to know about these bars before you indulge: they have almost zero sugar! There is no sugar in the filling (at all!). And the whipped cream is sweetened lightly with stevia. The only other sugar content is found in the raspberry filling and dates in the crust. I promise it doesn’t taste sugar free either I taste testers who eat everything try these and they said it tasted just like cheesecake! So you don’t have to worry about it tasting super healthy (even though they are).